This register is presented in order of date of burial. On the same line as the date is (where known) the reference to the relevant grave on the graveyard plan. JOHN CLIFFORD HARRIS aged 69 years died at 20 Amesbury Rd, Moseley (enemy action) on July 30, 1942 and his remains were buried in the family grave in Kingswood Chapelyard on Aug 4 by me:- John Carter? MARIANNE HARRIS aged 66 years died at 20 Amesbury Rd, Moseley (enemy action) on July 30, 1942 and her remains were buried in the family grave in Kingswood Chapelyard on Aug 4 by me:- John Carter? EDIT JANE APPLETON aged 57 years died at 20 Amesbury Rd, Moseley (enemy action) on July 20, 1942 and her remains were buried in the Harris grave (now full) in Kingswood Chapelyard on Aug 4 by me:- John Carter? ALBERT EDWARD MACE aged 78 years died at Cratmill Farm on March 13th /52 and his remains were buried in a new grave (2) in Kingswood Chapelyard on March 17th 1952 by me:- Keith C. Treacher? ELLEN JANE HORRIX aged 77 years died at 30 Shawshurst Lane, Hollywood on Sept 4th and her remains were buried in a new grave (2) in Kingswood Chapelyard on Sept 8th by me:- K. C. Treacher? JOHN HOLLAND aged 48 years OF May Lane, Hollywood who died on March 11th 1954, his remains were buried by me in a new grave (3) in Kingswood Graveyard on March 13th 1954 at 2 PM. John Munies? MINNIE BELL aged 80 years who died on May 12th 1954 at "Elim", Packhorse Lane; her remains were buried by me in Kingswood Graveyard on May 17th at 4 pm in a new grave (2). John P? CHARLES EDWARD WYNN WILLCOX aged 75 years died at Hollymoor Hospital on 5th Sept and his remains were buried by me in a grave (2) now full at 3.30pm; - Ronald McGraw? JOHN BREWER aged 81 years died at 364 Highters Heath Lane and he was buried in a new grave (for two) by me R McGraw? SARAH ANN PALMER aged 89 years died at 38 Maypole Lane, B'ham 14 & her remains were buried in grave for 2 (now full) by me in Kingswood Chapel yard:- (for) Harry Hesford. DENHAM AUGUSTUS MEADE died on 16/5/61 was buried in the family grave of Mr Sharrade Harris (for 4) (2nd Interment) on May 19th by Mr Donald Purkis [Christadelphian Minister], in Kingswood Chapelyard. AMY SMALLMAN, aged 40 years, of 8 Insall? Avenue, Kings Heath who died on March 2nd 1962, was buried in grave for two, now full. Anthony J Clements, Asst. 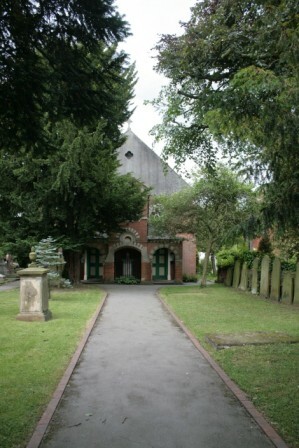 Curate, Parish of Immanuel, Highters Heath. After cremation, there followed the interment, in the grave of Margaret & Emily Reay, of the ashes of CHRISTINA AUGUSTA VAN DER WERFF, of 102 Taylor Road, Kings Heath, who died on March 7th 1962 aged 865. Eric H Spencer, Vicar of Springfield. ALFRED WILLIAM RYLEY of Limes Cottage, Forshaw Heath Lane, Earlswood, who died on Aug 25th 1962, aged 55, was buried in a new grave for two, one space remaining. Joyce Hazlehurst. CLIVE KENRICK, aged 83 years, who died on Sept 1st 1962 at his home, 8 Carpenters Road, Edgbaston, Birmingham was buried in the family vault. A R T Allan, Vicar of Edgbaston. JESSE STEVEN, aged 87 years of 293 Alcester Road, Drakes Cross, Wythall was buried in the family grave, having died at home on Sept 30th. Joyce Hazlehurst. JULIA ANN MORRALL, aged 88 years, who died on Sept 29th 1962 at 66 Raglan Road, Smethwick, was buried by me in the family grave. Arthur H Birtles, Minister, Church of the Messiah, Birmingham. ROBERT WILLIAM Dale, aged 72 years, who died at his home, 46 Hollywood Lane, Hollywood, on June 11th 1963, was buried in a new grave for two. A J Clements, Asst. Curate, Immanuel Highters Heath, B'ham. ARTHUR WYNN KENDRICK, aged 60 years who died at the Birmingham General Hospital on august 28th 1963 was cremated at Lodge Hill and the ashes were buried in the family vault. Arthur H Birtles, Minister, Church of the Messiah. VIOLET BRENDA GOODMAN, aged 36 years, who died in Brisbane, Australia on June 28th 1963 and was cremated there on July 1st 1963. Her ashes were buried in a new grave, two spaces remaining. Arthur H Birtles, Minister, Church of the Messiah. ROBERT EJI KATO, aged 40 years who died at the General Hospital, Birmingham on March 24th 1964 was buried in the family grave. Wilfred H Kimberley, Immanuel Church, Highters Heath, Birmingham. The remains of SUSAN DENT (Mrs) who died 24.3.80 were interred in the chapel yard on Tuesday 27.3.80. David H Good, 8 School Rd, Moseley, Baptist Minister. NB Mrs Dent was 100 yrs. Of age. New grave for two. NB Gravestone shows VIOLET WARING died on 14th November 1951. The cremated remains of ROSA WINIFRED SMITH who died in Paris on 30th July 1984, aged 74 years, were buried in her husband's grave by Rev Keith Hill. The cremated remains of JOSEPH HENRY CREES of 180 Hollybank Road, Birmingham 13 who died aged 67 years at Building Industries Training Centre, Lifford Lane, Kings Norton on 28 March 1990 were buried in the family grave by Keith Hill. The body of LILY ELIZABETH BARLEY who died aged 88 at Selly Oak Hospital was buried in the Family grave, now full, by Pastor Bull. The Cremated remains of FRANK DARBY were interred in a new plot in the Memorial Garden. 1 space remaining. Keith Hill. The cremated remains of EDNA NEED were in a new plot in the Memorial Garden. 1 Space remaining. Keith Hill. The cremated remains of THOMAS RICHARD HAYWARD were buried in a new plot in the Memorial Garden one space remaining. Keith Hill. DANIEL KELLY, grandson of Michael Charles Turrell his cremated remains were buried in the family plot now full. Keith Hill. The body of JOHN (JACK) BRIDGEWATER who died on 4th August 1994 was buried by me in a new grave for two. Aged 70 years. Died at Alexandra Hospital Redditch. Keith Hill. The body of PAULINE PARSONS who died on 27 October 1994 aged 51 at St. Mary's Hospital, London was buried by me in a new grave for two. Keith Hill. The body of FRANCIS GILBERT SHIMELL who died on 18th April 1995 aged 92 years at Solihull Hospital was buried in a new grave for two. Keith Hill. The body of DONALD JAMES HEMMING otherwise GERRARD MASTERS who died aged 73 years on 9th July 1995 at West Heath Hospital was buried in a new grave for one. Keith Hill. The body of MARY EVELYN BULL who died aged 81 yrs on 30th June 1995 at Alexandra Hospital, Redditch was buried in the family grave now full. Keith Hill. The body of VIVIAN SANDRA BROOKE aged 47 years who died at the Queen Elizabeth Hospital on 5th January 1996 was buried in a new grave for two, one place remaining. Keith Hill. The body of ANGEL CAROLINE SHIMWELL who died at Rosemary Lodge, 154 Alcester Road South, aged 88 years was buried in the family grave now full. Keith Hill. The cremated remains of BERYL ISOBEL CASTLE were buried by me (Aged 72 years, Died 23 April 1996) One space remaining. Keith Hill. The cremated remains of MAUREEN PERRETT, who died on 22nd February 2002, aged 69 years, were buried in a new plot in the Memorial Garden. One space remains. The body of DONALD FAWKES who died on 18th May 2004, aged 82 years at the Queen Elizabeth Hospital, Birmingham was buried by me in a new grave for one (H58). Keith Hill. The cremated remains of ARANKA KENRICK who died on the 24 December 2004 aged 92. Garden House, Harbourne Road, Birmingham was her home. She died at Birmingham Nuffield Hospital. Her ashes are in the left hand side at the foot of the family vault. Keith Hill. Service conducted by Tom Marriott. The body of MICHAEL STEED who died aged 65 at the Queen Elizabeth Hospital on 7th August 2005 was buried in a new grave for two. (His address was 127 Hurdis Road, Shirley) Keith Hill. Canon Michael Caddy - Salter Street and Shirley Team Ministry. The cremated remains of SUSAN THOMPSON of 4 Burford Rd, Hollywood were placed in the graveyard. The cremated remains of WENDY THELMA RICHARDSON aged 70 years who died on 30th December 2010 at Alexandra Hospital, Redditch were buried in the Memorial Garden by Rev Keith Hill. The cremated remains of MALCOLM HEWITT were scattered in the graveyard by his family. The body of JOYCE MARY STOKES aged 72 years who died on 17th October 2012 at Princess of Wales Community Hospital, Bromsgrove was buried in her husband's grave (now full) by Rev Anthony Howe. The cremated remains of BARRY GUY BOND aged 77 years of Hollywood, who died on 3rd October 2012 at Queen Elizabeth Hospital, Edgbaston were buried in a plot for two in the Memorial Garden by Diane Rutter. Space for burial of the cremated remains of one person. The body of JANE ANN HOLLINS formerly known as JANE ANN THORNTON aged 53 years who died on 25th October 2012 at 69 St. Bernards Road, Solihull was buried in a new grave for two by Rev Simon Ramsay. One space remains. The cremated remains of VERONICA MORROW, who died on 26th December 2012, aged 64 years, at Green Acres, 39 - 41 Vesey Road, Sutton Coldfield, B73 5NR were buried in her mother's plot in the Memorial Garden by her family. No space for any further cremated remains in this plot. The body of SHIRLEY JOAN GRETA WISE, of Shirley, who died on 1st February 2013, aged 77 years, at Solihull Hospital, was buried in a new grave for two by Rev Anthony Howe. One space remains. The body of OLIVE SYBIL STEED, of Hollywood, who died on 28th June 2013, aged 92 years, at Alexandra Hospital, Redditch, was buried in her husband's grave, now full, by Rev Anthony Howe. The cremated remains of DOREEN GERTRUDE COWELL, of Warstock, Birmingham, who died on 25th October 2012, aged 82 years, at Queen Elizabeth Hospital, Edgbaston, were buried in a casket in a new plot for three caskets by Rev Anthony Howe. The cremated remains of CLENDON WALTER COWELL, of Solihull Lodge, Shirley, who died on 12th May 2012, aged 77 years, at Solihull Hospital, were buried in a casket in the family plot by Rev Anthony Howe. Space for one casket remains. NOTE: The above two caskets were placed 2ft from the head of the grave and there remains space at the foot of the grave for a further casket. The body of DAVID FIELD, of Hollywood, Birmingham, who died on 6th October 2013, aged 69 years, at Queen Elizabeth Hospital Birmingham, Edgbaston, was buried in a new grave for two by Rev Anthony Howe. One space remains. The body of Baby JOEY, the stillborn child of Jamie Lee Hensey and Dennis Wheelwright of Alvechurch, Birmingham, was buried in a new half grave by Rev Anthony Howe. The body of THERESA ROWLEDGE (nee Tabone), of Solihull Lodge, Solihull, who died on 14th October 2013, aged 75 years, at Royal Shrewsbury Hospital, Shrewsbury, was buried in a new grave for two by Rev Canon Sean Grady, Catholic Priest, Our Lady of Lourdes, Yardley Wood, Birmingham. One space remains. The body of KENNETH JAMES NICHOLAS, of Wythall, Birmingham, who died on 21st October 2013, aged 89 years, at Queen Elizabeth Hospital Birmingham, Edgbaston, was buried in a new grave for two by Rev Anthony Howe. One space remains. The body of PHYLLIS LILLIAN BRIDGWATER, who died on 14th November 2013, aged 88 years, at Alexandra Hospital, Redditch, was buried in her husband's grave, now full, by Rev Anthony Howe. The body of GRAHAM JOSEPH STRANGE, of Hollywood, Birmingham, who died on 16th November 2013, aged 73 years, at Queen Elizabeth Hospital Birmingham, Edgbaston, was buried in a new grave for two by Rev Anthony Howe. One space remains. The cremated remains of ERNEST JOHN HODGETTS, of Spruce Grove, Alberta, Canada who died on 30th September 2011, aged 95 years, at Stony Plain, Alberta, Canada were buried in a casket in his parent's grave by Rev Anthony Howe. The cremated remains of ROGER STEPHENSON STOBBS, of Hollywood, Birmingham who died on 2nd August 2012, aged 75 years, at St Marys Hospice, 176 Raddlebarn Road, Selly Park, Birmingham were buried in a new plot for two in the Memorial Garden by Rev Anthony Howe. Space for burial of the cremated remains of one person. The c emated remains of JOAN MUNRO (nee Casebourne) of Sellywood House, 181 Sellywood Road, Bournville, Birmingham, B30 1TJ who died on 17th March 2014, aged 103 years, at Queen Elizabeth Hospital, Edgbaston, Birmingham were scattered in the graveyard by her family. The cremated remains of LILY BERTHA JENKINS of Sutton Coldfield who died on 14th September 1994 at the above address, aged 78 years, were buried in a new plot for two in the Memorial Garden by Rev Anthony Howe. The cremated remains of DAVID JENKINS of Kings Norton, Birmingham, who died on 11th January 2014, aged 93 years, were buried in a plot, now full, in the Memorial Garden by Rev Anthony Howe. The cremated remains of BETTY JOAN McCAUGHEY of Shirley, Solihull, who died on 13th April 2014, aged 88 years, at Solihull Hospital, Solihull, B92 2JL, were buried in the family grave by her husband. The cremated remains of KATHLEEN BERYL AINSWORTH who died on 8th December 2013, aged 83 years, at 12 Tan y Graig, Canal Road, Newtown, Powys, SY16 2JW, were buried in a new plot for two in the Memorial Garden by Mark Aldridge, Sexton. The cremated remains of BERYL MAY COLLINS of Briarcroft Care Home, 27 Packington Avenue, Sharp End, Birmingham, B34 7PB who died on 21st August 2014, aged 82 years, at Birmingham Heartlands Hospital, Bordesley Green, Birmingham, were buried in a casket in a new half grave for up to four caskets by Rev Anthony Howe. Space for three caskets remains. Note: the casket was placed in the top left quadrant of the plot. It is advised that the next interment be placed in the bottom left quadrant so that any headstone does not need to be removed. The body of ROBERT SYDNEY RICHARDSON, of Tibury Green, who died on 22nd December 2014, aged 65 years, at Solihull Hospital, Solihull, was buried in a new grave for two by Rev Anthony Howe. One space remains. The cremated remains of DORIS WATERS, formally of 4A Trumans Heath Lane, Hollywood, B47 5QB, who died on 22nd October 2014, aged 92 years, at Foresters Nursing Home, Walton Pool, Clent, Stourbridge, were buried in a biodegradable container in a new half grave for up to four containers by Rev Anthony Howe. Space for three containers remains. Note: the container was placed at the head of the plot and will be covered by the memorial. It is advised that the next interment be placed in front of the memorial. The cremated remains of WAYNE SIMMONDS who died on 28th December 2014, aged 60 years, at 1 Mentone Court, Hawthorn Park, Handsworth Wood, Birmingham, B20 1AD, were buried in a new plot for two in the Memorial Garden by Rev Anthony Howe. The body of BASIL BERNARD FRANCIS, of Redditch, who died on 17th April 2015, aged 91 years, at Alexandra Hospital, Redditch, was buried in a new grave for two by Diane Rutter. One space remains. The cremated remains of DEREK JOHN HENRY BOWKER of Epsom, Surrey who died on 3rd March 2011, aged 83 years at Epsom General Hospital, Dorking Road, Epsom were buried in the family grave by the family. Note: The ashes were placed centrally immediately in front of the existing headstone. Space for a further 3 ashes interments remains. The cremated remains of BET Y MABEL HAWKINS who died on 9th January 2015, aged 91 years, at Wilnecote Rest Home, At Manor Farm, Hockley Road, Wilnecote, B77 5EA were buried in an existing plot in the Memorial Garden by Rev Anthony Howe. No space for any further interments in this plot. The cremated remains of HAYDEN NOEL COLLINS who died on 11yh July 2015, aged 83 years at Bramley Court Care Home, 251 School Road, Yardley Wood, Birmingham, B14 4ER were buried in the family half grave by Rev Anthony Howe. Space for two caskets remains. Note: the casket was placed in the top right hand quadrant of the plot. It is advised that the next interment be placed in the bottom left hand quadrant so that any headstone does not need to be removed. The cremated remains of PAULINE HAZELWOOD who died on 7th February 2015, aged 74 years, at 11 Trueman's Heath Lane, Hollywood, Birmingham, B47 5QE, were buried in a new plot for two in the Memorial Garden by her family. The cremated remains of SARAH MELANIE GILL-PARSONS who died on 26th November 2015, aged 48 years, at Warwick Hospital, Larkin Lane, CV34 5BW, were buried in a new plot for two in the Memorial Garden by Rev Anthony Howe. The cremated remains of LESLIE RONALD RICHARDS of Hall Green, Birmingham, B28 0BH who died on 28th January 2016, aged 84 years, at Birmingham Heartlands Hospital, Bordesley Green, Birmingham, were buried in a casket in a new half grave for up to four caskets by Rev Anthony Howe. Space for three caskets remains. Note: the casket was placed in the top left hand quadrant of the plot. It is advised that the next interment be placed in the bottom left quadrant so that any headstone does not need to be removed. The cremated remains of MARTIN JONATHAN SMITH of Maypole, Birmingham, who died on 20th May 2015, aged 43 years, at Queen Elizabeth Hospital Birmingham, Edgbaston, were buried in a casket in a new half grave for up to four caskets by Rev Anthony Howe. Space for three caskets remains. The cremated remains of JOHN EDEN of Wythall, Birmingham who died on 16th December 2015, aged 73 years, at Queen Elizabeth Hospital Birmingham, Edgbaston, were buried in a casket in a new half grave for up to four caskets by Rev Anthony Howe. Space for three caskets remains. The body of ALMA DULCIE HOLLOWAY, of Warwick, who died on 9th April 2016, aged 93 years, at Warwick Hospital, Warwick, was buried in a new grave for two by Rev Anthony Howe. One space remains. The body of IVY MAY LANGLEY, of Maypole, Birmingham, who died on 21st April 2016, aged 98 years, at Queen Elizabeth Hospital Birmingham, Edgbaston, was buried in her husband's grave, now full, by Rev Anthony Howe. The cremated remains of MARJORIE EVERILL who died on 7th May 2016, aged 99 years, at Bobwood Court Nursing Home, Hewell Road, Redditch, B97 6AT were scattered on the grave of Adrian Fowler by Rev Anthony Howe. The body of MARGARET HILDA JORDAN formerly known as MARGARET HILDA FRANCIS, of Redditch, who died on 16th June 2016, aged 82 years, at Alexandra Hospital, Redditch, was buried in her mother's grave, now full, by Diane Rutter. The cremated remains of EVELYN GRACE FRESTON of Redditch who died on 6th August 2016, aged 78 years at Queen Elizabeth Hospital, Edgbaston, Birmingham were buried in the family grave by Diane Rutter. Note: The ashes were placed centrally at the head of the plot which does not currently have a headstone. Space for a further 3 ashes interments remains. The cremated remains of PHYLLIS ANNIE DRINKWATER, of Druids Heath, Birmingham, who died on 6th July 2016, aged 90 years, at Queen Elizabeth Hospital, Edgbaston, Birmingham, were buried in a her family plot, now full, in the Memorial Garden by the Sexton, Mark Aldridge. The cremated remains of JUNE MIDGLEY, of Small Heath, Birmingham, who died on 12th May 2016, aged 85 years, at Marie Curie Hospice, Marsh Lane, Solihull, B91 2PQ, were buried in a new plot for two in the Memorial Garden by Rev John Midgley. One space remains. The body of WAYNE CHILLINGWORTH, of Solihull, who died on 17th October 2016, aged 52 years, at Solihull Hospital, Lode Lane, Solihull, was buried in a new grave for two by Diane Rutter. One space remains. The cremated remains of DORIS SIMMONDS, of Birmingham who died on 24th August 2016, aged 84 years, at Queen Elizabeth Hospital, Edgbaston, Birmingham, were buried in a her family plot, now full, in the Memorial Garden by Rev Anthony Howe. The body of NORAH DOROTHY WILDAY, of Holywood, Birmingham, who died on 16th January 2017, aged 92 years, at Queen Elizabeth Hospital, Edgbaston, Birmingham, was buried in a new grave for two by Rev Anthony Howe. One space remains. The body of RICHARD GRAHAM MONK, of Holywood, Birmingham, who died on 30th January 2017, aged 81 years, at Queen Elizabeth Hospital, Edgbaston, Birmingham, was buried in a new grave for two by by Rev Anthony Howe. One space remains. The body of MARANNA MURIEL POLLARD of Kings Norton, Birmingham, who died on 23rd March 2017, aged 70 years, at Queen Elizabeth Hospital, Edgbaston, Birmingham, was buried in the family grave, now full, by Rev Anthony Howe. The cremated remains of CHRISTINE ANNE BUTLER, of Hollywood, Birmingham, who died on 7th November 2016, aged 67 years, at her home, were buried in a new plot for two in the Memorial Garden by Rev Anthony Howe. One space remains. The cremated remains of DEAN MARK ROWLAND, who died on 21st March 2017, aged 27 years, at Flat 2, St John's Court, Victoria Road, Tamworth, B79 7HU, were buried in a casket in his family plot, by Rev Anthony Howe. Note: The casket was placed in the top right hand quadrant of the plot. It is understood that the previous interment (Tom Mytton on 10th November 2009) was in the bottom right quadrant at the foot of the plot, it is advised that the next interment be placed in the bottom left hand quadrant so that any headstone does not need to be removed. The body of DOREEN PATRICIA POTTER, of Shirley, who died on 26th May 2017, aged 83 years, at Solihull Hospital, Solihull, was buried in a new grave for two by by Rev Anthony Howe. One space remains. The cremated remains of GLADYS IRENE LAYTON, of Solihull, who died on 11 May 2017, aged 90 years, at Ardenlea Grove, 19-21 Lode Lane, Solihull, B91 2AB, were buried in a her family plot, now full, in the Memorial Garden by Rev Anthony Howe. The body of BERYL AGNES VALE who died on 5th September 2017, aged 84 years, at 50 Jutland Road, Billesley, Birmingham, B13 0TX, was buried in a new grave for two by Rev Anthony Howe. One space remains. The cremated remains of BETTY EMMA BUCKLEY, who died on 17th May 2017, aged 88 years, at Ambleside Nursing Home, Evesham, Dodwell Stratford-upon-Avon, CV37 9ST were buried in her family grave by her family. The body of YVONNE FLORENCE PSAILA who died on 15th September 2017, aged 71 years, at 37 Kingsthorpe Road, Kings Heath, Birmingham, B14 4NE was buried in a new grave for two by Rev Anthony Howe. One space remains. Note: Line of bricks behind headstone. Hole dug 26 inch by 15 inch protruding 5 inch past right hand end of headstone base and leaving 15 inch at the left hand end for a third casket. The body of LAYTON LEE GWINNETT, who died on 6 October 2017, aged 9 days, at Birmingham Children's Hospital, Birmingham, was buried in a new half grave by Rev Anthony Howe. Note: The coffin was placed in a hole 26 inches long and 16 inches wide, 52 inches in front of the back of the base stone of the headstone on grave H92B and 20 inches in from the path on the left-hand side. There is space for a casket on each side of the coffin if placed with the long side parallel with the coffin. The cremated remains of DOROTHY PHYLLIS HEMMINGS, of Althorpe Rest Home, Main Street, Althorpe, DN17 3HJ, who died on 30th June 2003, aged 92 years, at Scunthorpe General Hospital were buried behind the headstone of her family grave by her family with the Sexton in attendance. The cremated remains of CHRISTINE THOMAS, of 126 Pye Nest Road, Halifax, HX2 7HS, who died on 30th January 2017, aged 70 years, at Huddersfield Royal Infirmary were buried in a new plot for one in the Memorial Garden by Rev Anthony Howe. The body of JOYCE BRENDA UNWIN, who died on 12 December 2017, aged 88 years, at Queen Elizabeth Hospital, Edgbaston, Birmingham, was buried in a new grave for two by Rev Debbie Collins, of Holy Cross Church, Billesley. One space remains. The body of MAURICE DAVIS, who died on 18 December 2017, aged 64 years, at 5 Dark Lane, Hollywood was buried in a new grave for two by Rev Anthony Howe. One space remains. The cremated remains of BRENDA DORIS DOIDGE, who died on 11 December 2017, aged 86 years, at Queen Elizabeth Hospital, Edgbaston, Birmingham were buried in a new plot for two in the Memorial Garden by Rev Anthony Howe. One space remains. The cremated remains of CYNTHIA MARY DOCKER who died on 15 December 2017, aged 84, at Alexandra Hospital, Redditch were buried in a casket in a new half grave by Rev Anthony Howe. Space remains for 3 further caskets. The body of KEN MORRIS, who died on 5th March 2018, aged 90 years, at 21 Hollywood Lane, Hollywood was buried in his wife's grave, now full, by Diane Rutter. The body of ANGELA MARY WHEELWRIGHT, of Hollywood, who died on 3rd April 2018, aged 78 years, at Queen Elizabeth Hospital, Edgbaston, Birmingham was buried in a new grave for two by Diane Rutter. One space remains. The cremated remains of JOHN THOMAS WATERS, of Shirley, who died on 23rd February 2018, aged 87 years, at Solihull Hospital, Lodge Lane, Solihull, B91 2JL were buried behind his family's grave by his family. Note: Left hand side behind headstone. Room for further ashes on right hand side behind headstone. The cremated remains of PERCY WILSON who died on 4th April 2018, aged 88, at 18, Mynors Crescent, Hollywood, B47 5JG were buried in a casket in his partner's grave by the Sexton. Space remains for 2 further caskets. Note: the casket was placed in the top right hand quadrant of the plot. It is advised that the next interment be placed in the bottom left quadrant so that any headstone does not need to be removed. The cremated remains of MERVYN HARRY FREDERICK PERRETT, who died on 6th October 2017, aged 91 years, at 22 Shawhurst Croft, Hollywood were buried in his family plot, now full, in the Memorial Garden by his family. The cremated remains of DAVID GEORGE DAWKES of 95 Houndsfield Lane, Hollywood,B47 6LS, who died on 22nd July 2018, aged 73 years, at his home, were buried in a casket in a new half grave for up to four caskets by Rev Anthony Howe. Space for three caskets remains. The cremated remains of ROY FRANK HAZELWOOD of 11 Truemans Heath Lane, Hollywood, B47 5QE, who died on 19th March 2018, aged 82 years, at Queen Elizabeth Hospital, Edgbaston, Birmingham, B15 2WB, were buried in his family plot, now full, in the Memorial Garden by his family. The cremated remains of LILY GREENING, who died on the 26 October 2018, age 91, at Glenfield House Nursing Home, Birmingham, were buried in her husband's plot, now full, in the Memorial Garden by Diane Rutter. The cremated remains of FRANCIS ELIZABETH (BETTY) NEVIN (nee Orton) who died on 8th October 2018, aged 83, at 32a Dog Kennel Lane, Halesowen B63 3BY, were buried in a casket in a new half grave by her family with the Sexton in attendance. Space for three caskets remains. The cremated remains of JOAN MURIEL FLORENCE who died on 24th October 2018, aged 92 years, at Orchardown Rest Home, 4-6 Old Orchard Road, Eastbourne, E Sussex, BN21 1DB, were buried with the cremated remains of her husband, DAVID L FLORENCE (from a container in the plot) in a plot in the memorial garden, now full, by Rev Anthony Howe. The cremated remains of MOLLY JEAN EUSTACE (nee Mason) of 68 Shawhurst Lane, Hollywood, who died on 13th October 2009, aged 78 years, at Alexandra Hospital, were buried behind the headstone of the grave of Ernest Eustace by Rev Anthony Howe. The cremated remains of DENNIS JOHN EUSTACE, who died on 4th February 2019, aged 93 years, at Alexandra Hospital, were buried behind the headstone of the grave of Ernest Eustace by Rev Anthony Howe. The cremated remains of FRANCIS BAKER who died on 3rd June 2018, aged 96 years, at Stratford Court Residential Home, 33-35 Highfield Road, Birmingham, B28 0EU, were buried in the plot in the memorial garden of her husband, JOHN BAKER, now full, by her daughter.